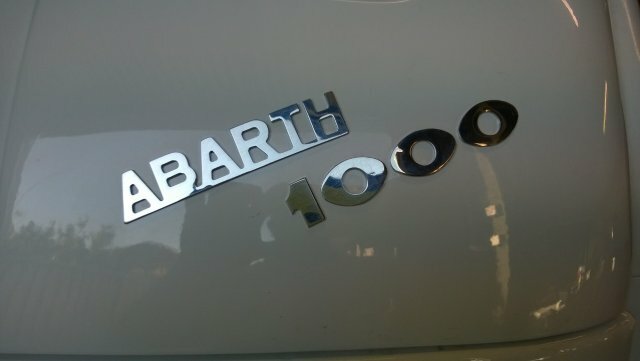 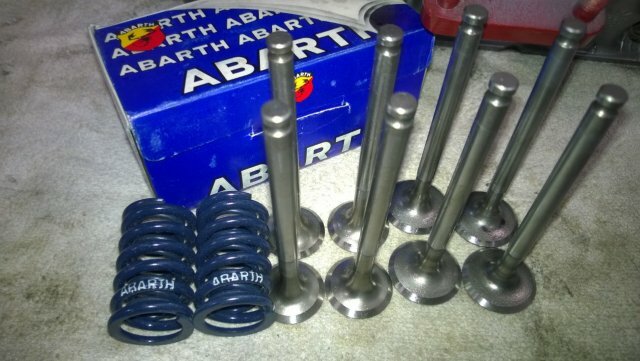 Wayne P. has for the last decade or more, has been acquiring the very best in Abarth parts new from all over the world! 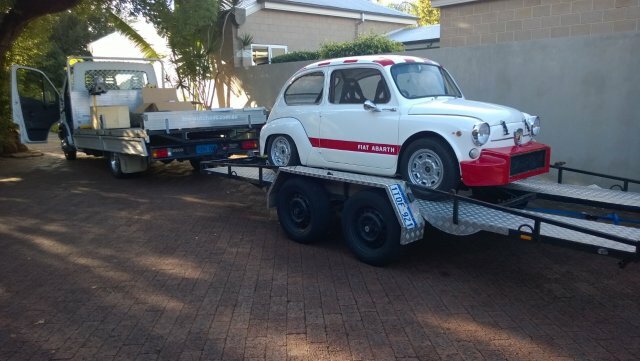 Wayne a very well know Fiat Enthusiast in Perth has put together some very nice little Fiat’s over the years, Racing his fantastic Blue modified 500D in Tarmac Rally Events and at Club level too, lately his attention has turned into Vintage Motorcycles, so passion for the mighty little Abarth’s not where it was, so after many discussions over the years (mainly me doing the discussing ,much arm twisting, me crying,etc )…….Sold it to ME! 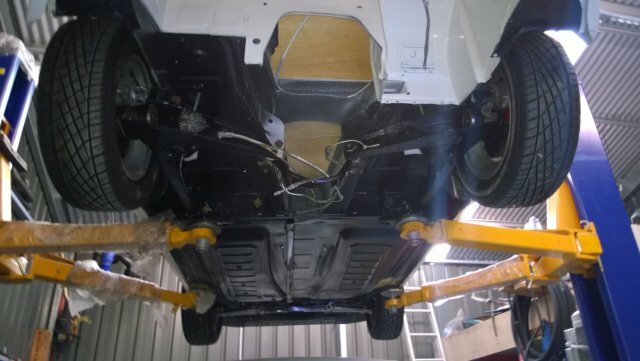 Wayne started with a 1962 600D shell, did the work on the body himself to a “Top Shelf” standard, removing all minor rust (Yes it is a Fiat after all!) 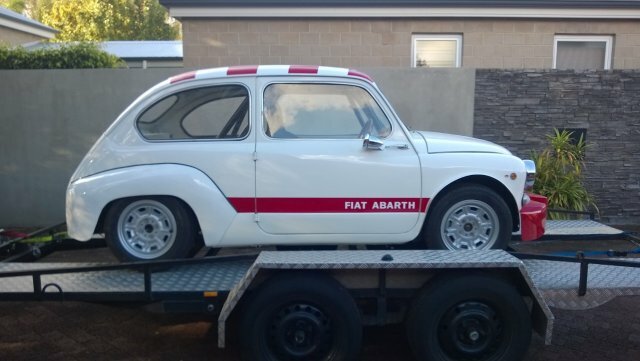 and a friend painting in Abarth White with Red stripe down the door, todate the 1000tc is a rolling shell on a coil over kit with double wishbone front suspension, 4 wheel disc brake set up and full original Abarth Jaeger binnacle set with a Wayne magic binnacle surround, full Abarth late nose cone and radiator set up using twin thermo’ fans mounted behind, from our friends at Go-Gear, Wayne purchased and fitted an Italian OMP Rollcage and Race seats ….with many other important goodies I’m sure! 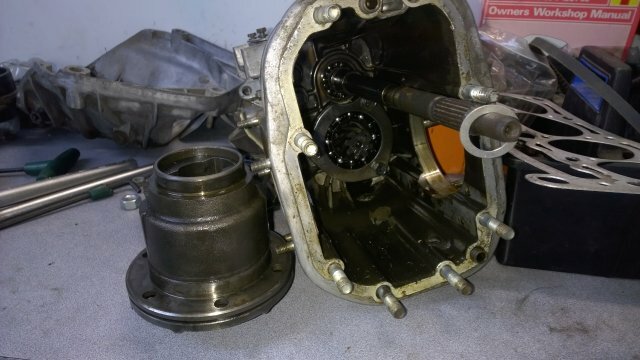 Engine and parts …. 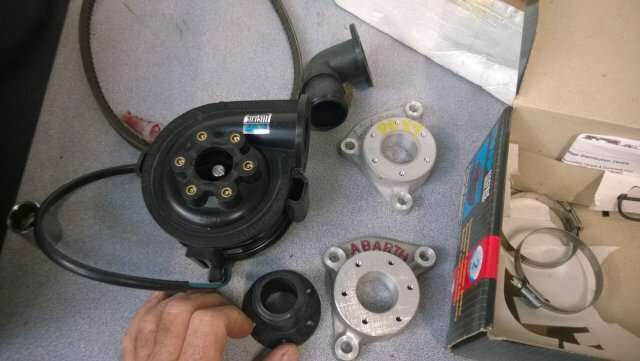 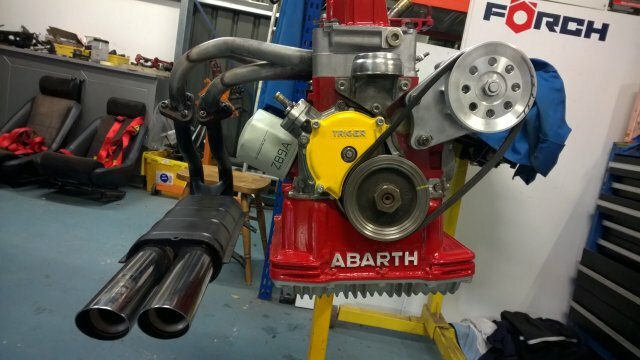 a Abarth A112(A2) 1050cc from Italy second hand for rebuild, and light weight rods with high comp’forged pistons for 68mm bore, Abarth style timing belt conversion kit , …last but not least an Abarth type Electric water pump system with mountings to fit A112-A2 motor! 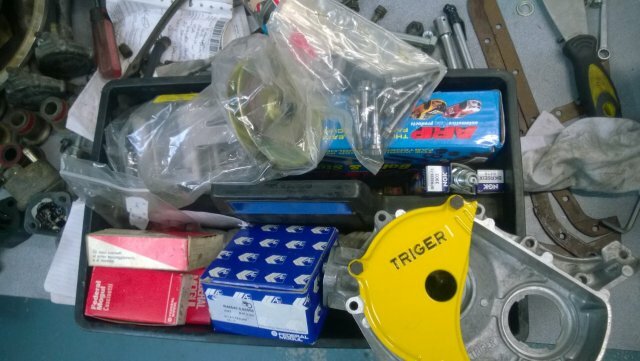 Late May 2014 - Wow so far going through all the parts from Wayne can see what a busy boy he has been!….I think the smart thing to do (not my usual way!) 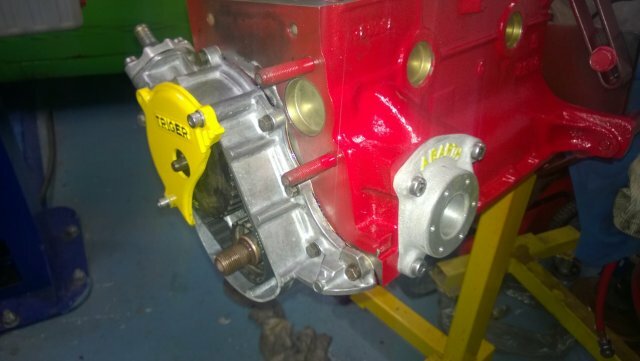 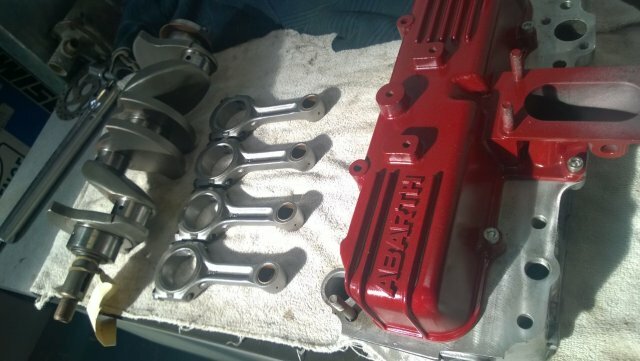 is to build up the A112 motor with valve stem seals, rings, big end/main bearings, maybe polish the crank and rods, port the head, etc so….. basically “Standard” with the other gear like Trigger Cambelt conversion kit, Abarth A112 Alloy Rocker cover with 32 carby attached manifold, some bits from my 750Abarth motor built for the 850TC (20 years ago and never used) like rocker shaft spacers and a Camshaft Engineering 40/80 Camshaft with 7.4mm lift, done specially for Linsey Derriman a long-time mate of CEC. 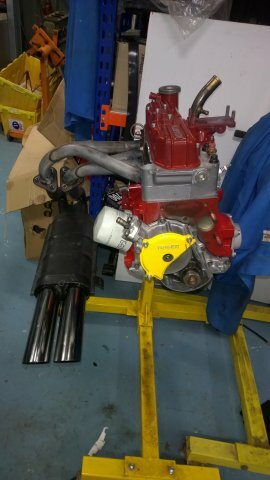 This should be a great little motor in its own right which frees me up to complete the 1000TC whole car, when the new Motor is ready after testing in the 1000 at afew events, will make a fantastic upgrade to the 850TC ! 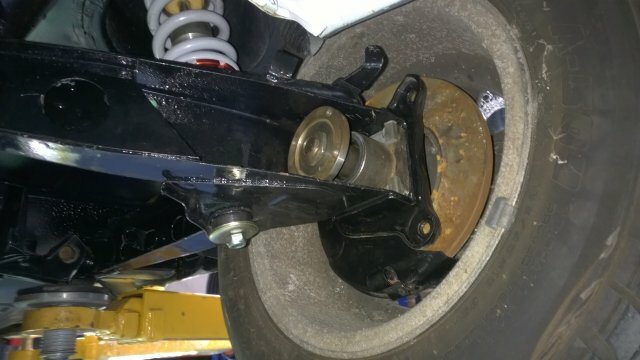 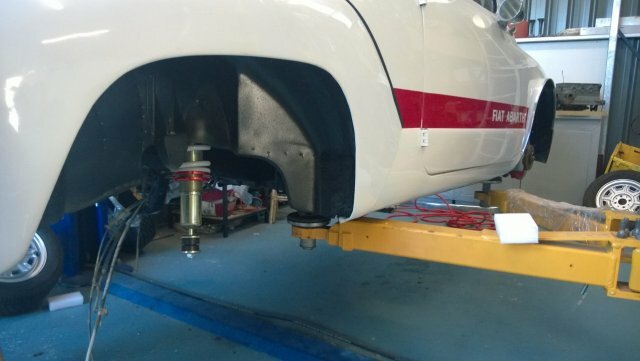 Update 5/2014- Rear coil overs now fitted, Rear arms removed for rethink and refit of disc conversion, steering wheel swap to Abarth 3spoke with horn badge. 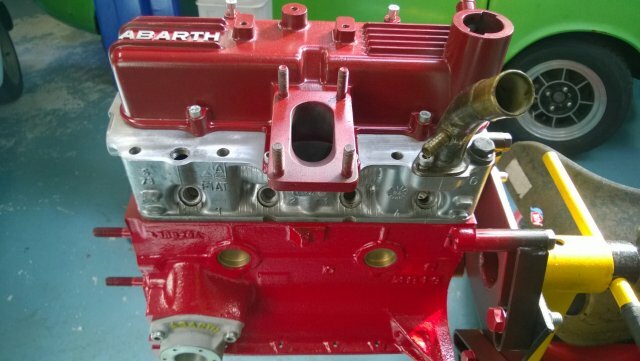 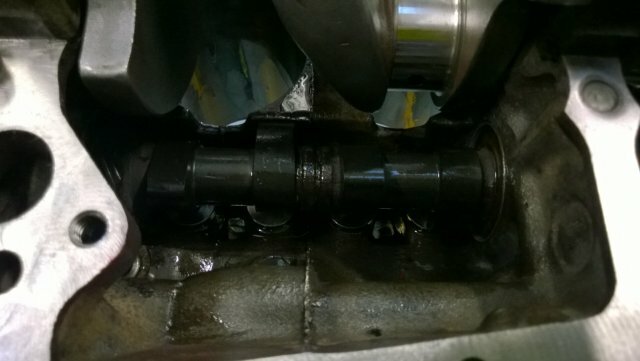 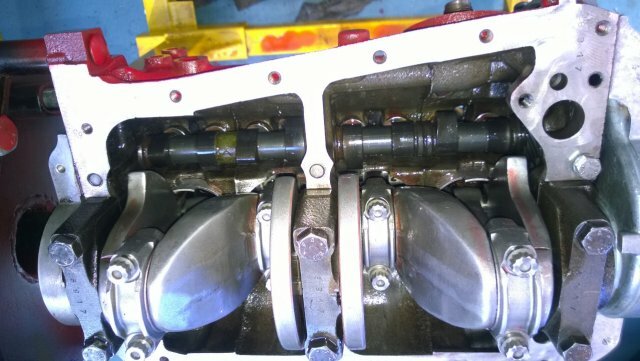 Update 6/2014- Polished Crank and Rods come back from “Shot Pein” ,resize and balancing, head machined and serviced, block and Rocker cover is now Red! 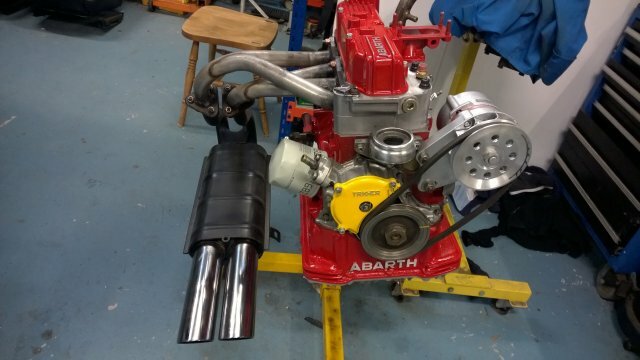 Polished intake port and manifold to suit re-kited 32DMTR carby and Abarth Valve Spring set purchased, core plugs and Abarth alloy water connector to electric water-pump fitted, now the shaved, shot-peined and balanced crank in and tensioned, 30/70 Stradale’ Camshaft with reground followers in and they spin very well!….with Triger timing belt conversion looking good! 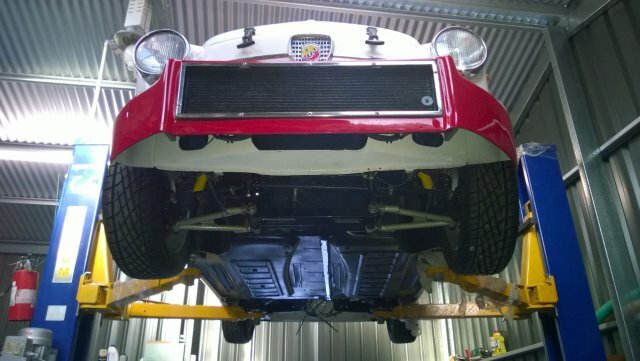 Update 7/2014- Opps! 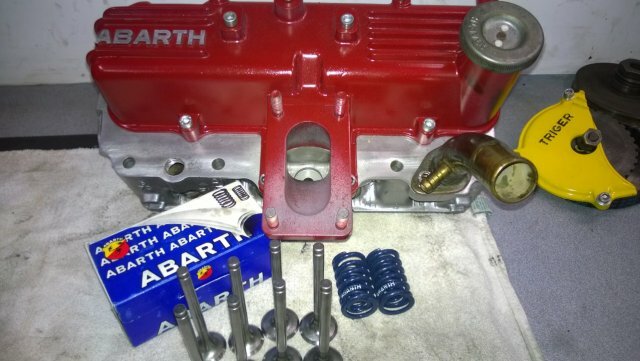 had to remove crank, front and rear cover/seals, etc to drill and tap block for the ARP Head Stud kit, but now that’s done and cleaned,it’s back to the rebuild with all the goodies!!! 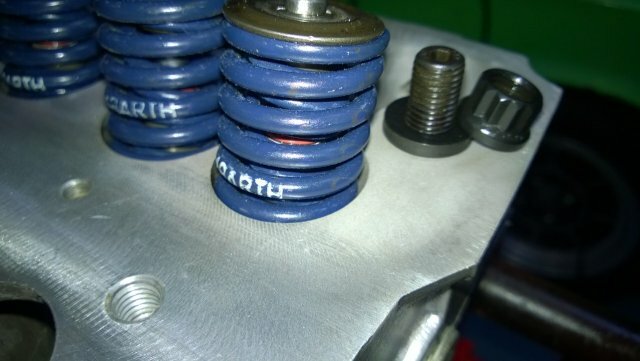 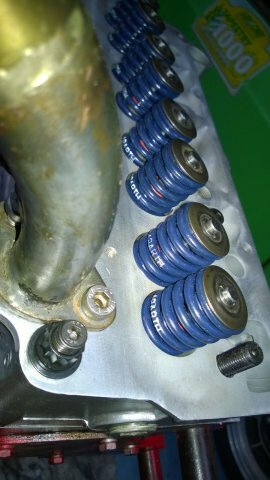 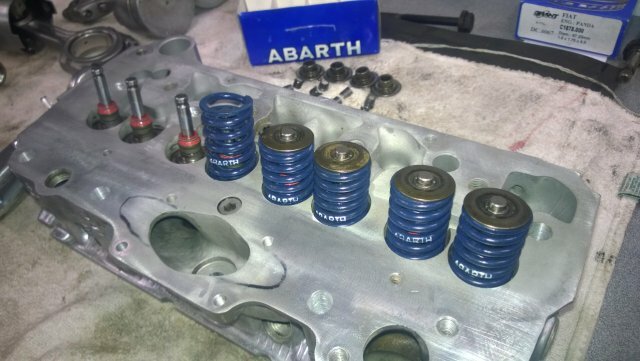 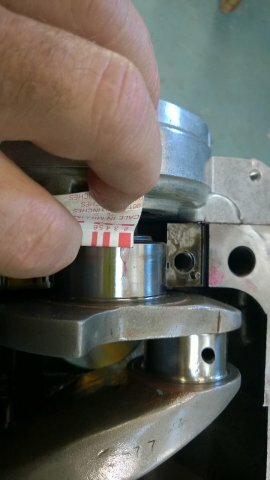 ..Head has been assembled with the nice Abarth double valve spring set ! 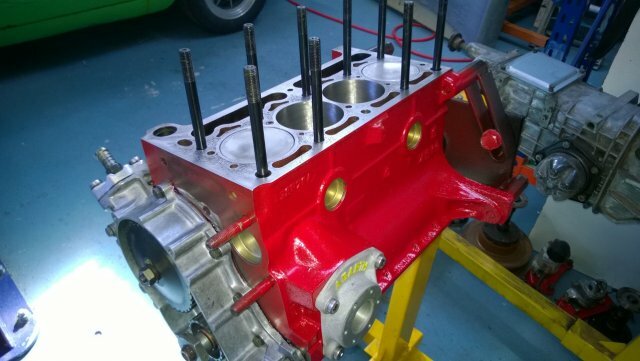 Update 8/2014 – As Time permits me to work on my own toys (weekends)things are happening! 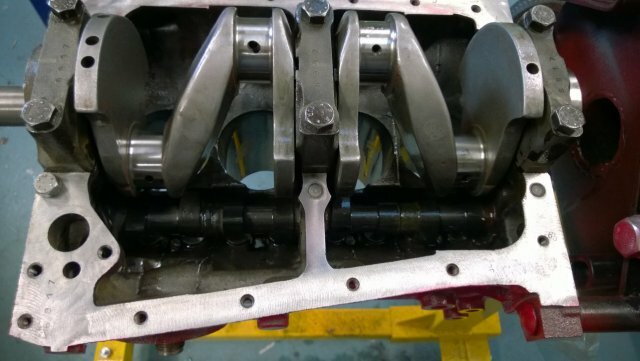 The Crank is in and “plasti-gauged” to perfection, rings on pistons and into bores with correct ring cap, ARP rod bolts used and spins cleanly, ARP headstuds are fitted after block drilled to m10x1.25 , head has been drilled to suit lager bolt. 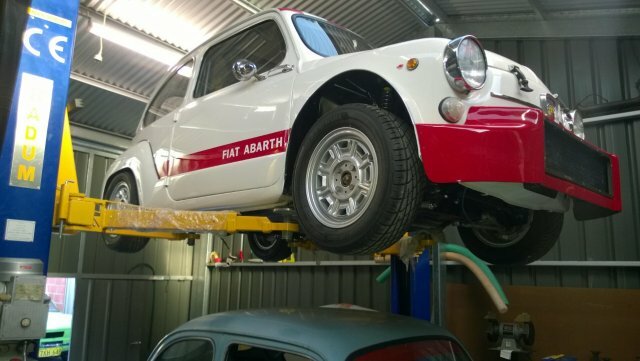 Update 11&12/2014 - The mighty little 1000Tc is on the hoist and parts have arrived from Italy to fit, Diff’ carrier and axel bearing had to be an odd size, only fit Autobianci A112 and Fiat 127 ! 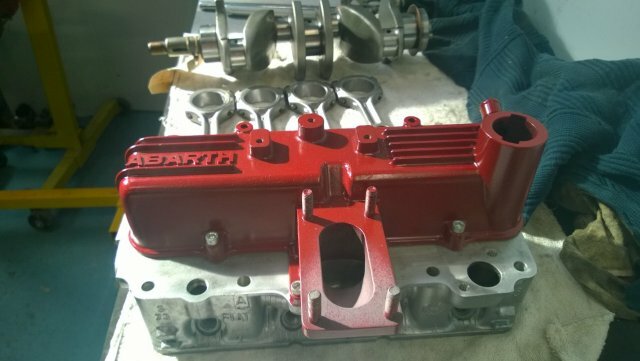 The Abarth Replica 2pce sump has been polished inside and painted Red outside for porosity reasons, this replica oil sump is very heavy compared to what Abarth himself would have done ,sorry to say the cast alloy is not upto the Abarth standard! 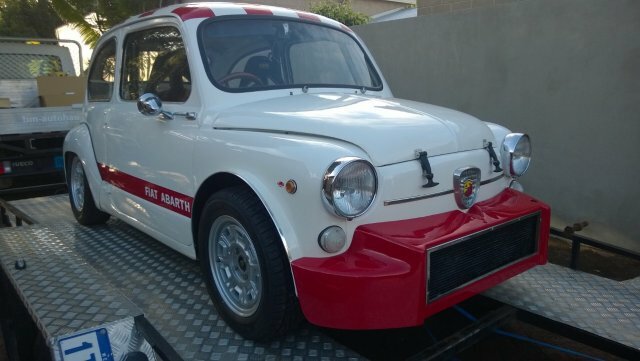 Final update 1/2017- Traded the mighty 1000TC due to a “Time Poor” situation for more large projects, The Fiat Abarth 131 Stradale’ programme has taken over the time and money for the future as we see it…Sad, but gone to another Fiat Abarth Enthusiast Lance Cowardine ……looking to move several cars and end up with “Afew” he will hopefully complete it as it should be!